When we visited my maternal grandmother in India during a trip last year, I noticed a very large woody shrub with elongated, strikingly veined leaves and dotted about were some beautiful egg-coloured flowers. I say, “egg”, as the flower was white with a yolk-yellow centre, very much like primroses. The flower in the picture is opening and has “exotic” written all over it. I didn’t know what it was but have now found out that it is called Plumeria or commonly, the Frangipani plant. I don’t know what this particular variety is, perhaps it is “Aztec Gold” or “Vishnu Gold” but I simply don’t know (neither did my gran, apparently it just grew there). It is a very pretty flower but Plumeria is one for the tropics only, unless you have a nice warm greenhouse or conservatory to keep it in over the winter. 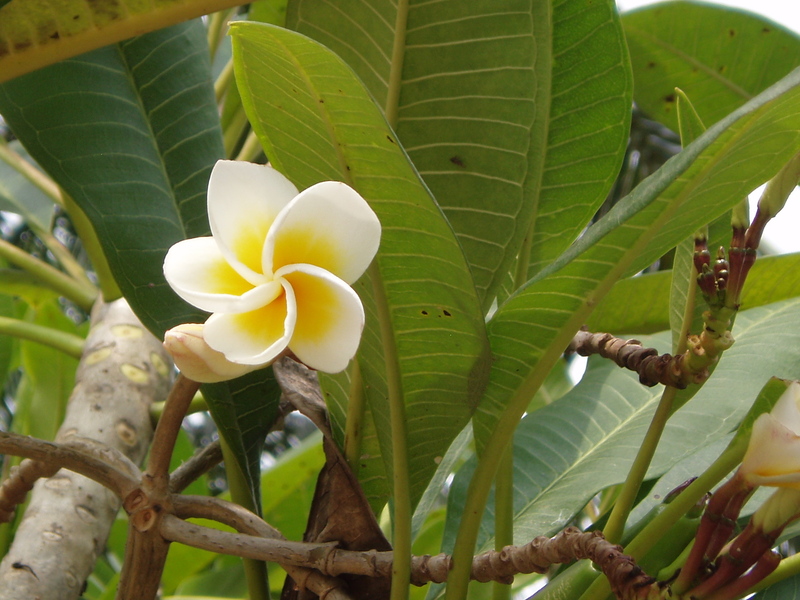 There are several online nurseries that have made a niche for themselves by importing and propagating Plumeria only (as well as supplies to keep it alive outside the tropical zones). The Plumeria in the picture wasn’t full of flowers but then we weren’t there at the right time of year. Although they look very pretty, I wouldn’t want to having one for myself as I don’t fancy having to handle a plant that can become the size I saw. The flowers are fragrant too but I couldn’t smell this flower as it was unfolding way above my head.